The visit of an old friend, Mel Finzer, from Chicago, who I had last seen back in November on our expedition around Colorado and Wyoming, was the perfect opportunity for a return visit to North Wales, and it didn’t disappoint. The WHR were running two of their NGG16 Beyer-Garratts, 87 (Cockerill 1936) and 138 (Beyer-Peacock 1958) as well as the two mainline diesels, Vale of Ffestiniog (C H Funkey 1968) and Castell Caernarfon (C H Funkey 1968) whilst the Ffestiniog rostered two Double Fairlies; Merddin Emrys (Boston Lodge 1879) and Earl of Merioneth/Iarll Meirionydd (Boston Lodge 1979). And although it wasn’t wall to wall sun – this is North Wales after all – we enjoyed some sun or bright conditions on all three days. And to top it all Friday 20th was the first day of the WHR’s Rail Ale Beer Festival ☺. To round things off, on our return journey we stopped off at Llanfair and Welshpool for a quick look at the W&LLR before an afternoon at Old Linslade and a date with Earl of Mount Edgcumbe – but that’s another story. All in all it was a very enjoyable few days away from the hustle and bustle of SE England enjoying the sounds and smells of steam (and diesel) trains, amid some great mountain scenery. 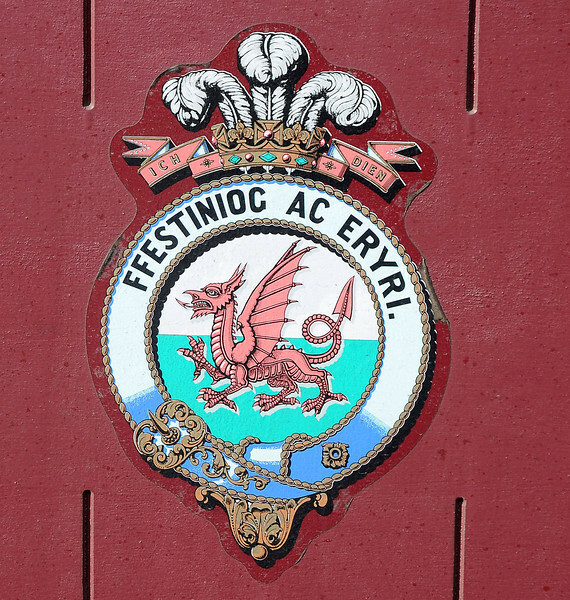 The coat of arms - in Welsh - of the Ffestiniog & Welsh Highland Railways.